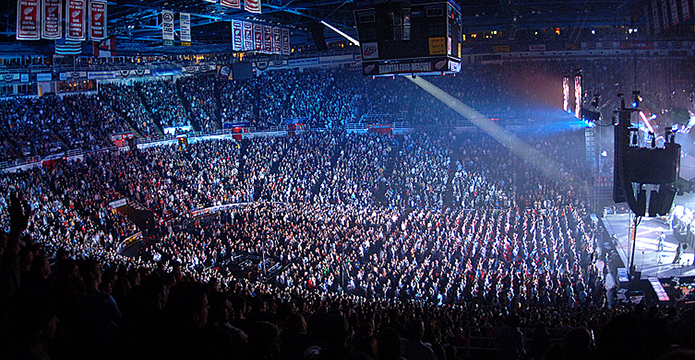 Joe Louis arena, steps from the Detroit River, was a major concert venue for 35 years. Writing about Detroit's Joe Louis Arena was enjoyable because it took me back not just to my Michigan sports roots, but also to a couple very memorable concerts, the Police in 1983 and U2 in 1985. And when I saw what an astonishingly horrendous job the Detroit News did covering the appearance recently at JLA of one Louis Farrakhan, I could not resist adding my thoughts to the piece. Detroit was such an ignored mess in the 1970s and 1980s. As New York reframed itself in many ways, cleaned up Times Square and reduced its crime rate, Detroit just got worse. Its slow destruction is such an astonishing tale of incompetent leadership and corruption. And now its comeback has begun, allegedly. Joe Louis Arena will likely be torn down to be replaced by a giant new arena development brought to reality by one family, the owners of several Detroit sports teams, who have invested and attracted hundreds of millions of dollars into the city. Watching how that project spurs further investment will be interesting.